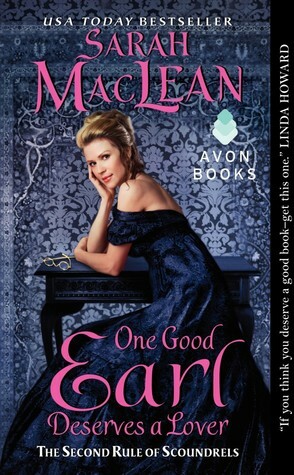 One Good Earl Deserves a Lover is not going to be one of my favorite books. It isn't going on my keeper shelf to be re-read over and over again (good thing, since it is a library book). I'm not going to be tempted to name any pets Pippa or Cross/Jasper. It wasn't that kind of book. That said, it isn't a bad book. In fact, it is better than many of the other books I've read in a long time. It is the second book in Ms. MacLean's Rule of Scoundrels Series and follows Philippa "Pippa" Marbury, sister of the first book's heroine, and Cross (Earl Harlow), business partner to the first book's hero. Pippa is "odd" because she liked learning and tended to talk about things that other people wouldn't have bothered to even learn about--she knew things like the names of every bone in the human body. She's also about to be married, causing her to panic over what would happen after the wedding. Being the person she is, she decides to read the marriage ceremony in the Book of Common Prayer, which instead of helping only makes her panic more. Why? Because it talks about marrying for lust. The book warns against it, but Pippa is more concerned that there wouldn't be any lust in her marriage and that she wouldn't be able to tempt her husband--she's odd, so of course no one could ever find her attractive, especially since she also wore glasses. She comes up with a plan: she's going to do some research and attempts to make Cross her "research associate," showing up at The Fallen Angel, a gaming hell he and his friends run, and propositioning him. Cross thinks she's insane. No aristocratic woman would ever ask to be ruined and that's just what Pippa wanted. He turns her down, but eventually agreed to help her because he feared that not doing so would cause her to do even dumber things than asking him for help. I did like the main characters. Pippa, the scientist. Cross, the sinner. They were a fun pairing and it was fun to read about them. However, there were things about each of them that drove me up a wall. Pippa, who is supposed to be a very smart woman, was at times extremely stupid, denying things that were so easy to see that she might as well have been blind. For instance, at one point, she meets with Lavinia, a woman who looks a lot like Cross--they have the same eyes and hair color and they're both taller than most other people at that time--but instead of coming to the conclusion that they were related, she decides that Lavinia was one of his paramours. It is obvious to her that Cross loves Lavinia, but Pippa continually misreads the type of love. It isn't until Lavinia tells her the truth that she is able to change her mind. Cross was also a bit annoying at times, especially as the end of the book nears. You see, he blames himself for his brother's death and his sister's injury, and because of this, he has decided that he is unworthy of everyone around him, including Pippa. He sees himself as dark and her as light, and even after it is clear that they love each other, he pushes her away because he thinks that he has tainted her with his darkness. She goes out of her way to make him realize how much she loved him and how he was worthy of that love, but he still doesn't want to believe it. Despite these flaws, I still rooted for them. There was a point, however, in which I wanted to throw the book against the wall. That was when the most contrived, most predictable plot point showed up--a forced marriage. No, Pippa and Cross were not discovered (well, not by anyone who would force them to marry at any rate). Digger Knight, the owner of a competing Gaming Hell, threatens to ruin Pippa if Cross did not marry his daughter, Meghan. His hands tied, or so he thought, Cross gives in and becomes engaged to the young woman. Since Knight had tried using Lavinia to get Cross to marry Meghan and he was at least a little aware of what was going on between Cross and Pippa, it was easy to see this coming. If I were a praying type of person, I would have prayed that this wouldn't happen. Of course, things had started to go well between Pippa and Cross, so a new obstacle needed to be thrown in their way. They couldn't just have their happily ever after with 100 pages to go and it was too soon to end the book, so we got a forced engagement with no seeming way to fix it. Obviously, it does get fixed--and by Pippa, but it was enough of a contrivance to sour the book a bit. I would have much preferred a shorter book than one with this plot point in it, but that is not what I got.